Fisheries science is not limited to major fisheries industries such as fishing, fish farming, and manufacturing and processing of fish and other seafood, but is in fact a field of study encompassing all aspects of the aquatic environment and human beings’ relationship to it, including aquatic plants and animals, living resources, the marine ecosystem, energy, aquatic biochemistry, economics, fisheries education and more. Recently it seems to be subdivided into ever more precise sub-categories, expanding beyond the bounds of conventional fisheries science, and incorporating remarkable advances in basic science as well. Founded in 1932, the Japanese Society of Fisheries Science is an organization with over 4,000 members, authoritatively representing Japan’s fisheries science community. 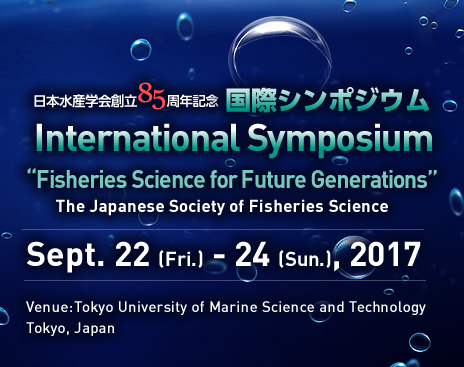 Last year (2017), we celebrated the 85th anniversary of our founding with several commemorative projects, including a commemorative ceremony in September, an international symposium, publication of the New Japanese-English Dictionary of Fisheries Science, and publication of an 85th anniversary magazine (currently in preparation). In addition, at our spring conference in March of this year we held a symposium, organized by our board of directors, on “The Future of the Japanese Society of Fisheries Science: Challenges and Prospects.” At these symposiums, various proposals were made on how to lead the Japanese Society of Fisheries Science forward into the future. Specific issues raised were our financial situation, decline in number of members, response to internationalization, and age- and gender-related bias in committee activities. In terms of our finances, in order to reduce the cost of publishing academic papers, we are planning to publish our Japanese-language journal Nippon Suisan Gakkaishi primarily in electronic form to reduce the cost of printing and shipping. I believe a more stable financial footing will enable the exempt the authors of both Nippon Suisan Gakkaishi and Fisheries Science from heavy page charges to encourage more active submission of higher-quality articles. As for the number of members, there has been a marked decrease in the last ten years in young members, students, and even senior members who have long been faithfully supporting the society, and it might be necessary to establish a new membership system to halt this decline. With regard to internationalization, the international symposium commemorating the 85th anniversary of our establishment had over 300 participants from other countries, and we are receiving more submissions to our journal from abroad. It seems that overseas researchers are taking a keen interest in the activities of the Japanese Society of Fisheries Science and looking for communication opportunities with us. In view of this situation, I believe we must further promote the internationalization of the Society. We should open the door for researchers from foreign countries to our regular annual conferences. Also, we should further boost the number of contributions from overseas to our international journal Fisheries Science. Meanwhile, in terms of age and gender disparity, we realize that the percentage of younger and/or female members of various committees playing central roles in the Society’s activities and management is very low. n the very near future, we wish that many young and female members are actively involved in the Society’s committees to bring greater vitality and new ideas to our activities. 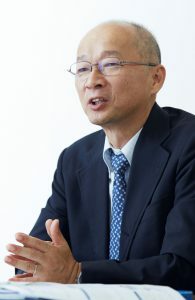 While we are facing a range of challenges, as outlined above, we will respond with resolute action, addressing each and every issue in turn, and continue to advance the mission of Japanese Society of Fisheries Science. In recent years, fisheries science as an academic field has become so broad that past models are no longer valid. The Japanese Society of Fisheries Science is a preeminent academic society bringing together the widely disparate areas of fisheries science. Now more than ever, we carry out a vital mission as an organization representing the fisheries science world. I am aware of the heavy responsibility that comes with my appointment as President, and while my abilities are limited, I will exercise them to the fullest in fulfilling this responsibility. I look forward to your kind cooperation.